Marc Chagall (Russian-born French painter, 1887-1985), "The Praying Jew" (1923, copy of 1914 work), oil on canvas, 116.8 x 89.4 cm, Art Institute of Chicago. Larger image. Martina Shapiro, "Portrait of the Rebbe" (2004), oil on canvas, 24x30. Portrait of the Lubavitcher Rebbe - Menachem Mendel Schneerson. Another (2000). Alton S. Tobey (1917-, Rabbi, oil on canvas, 35 x 27.5. 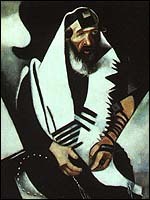 Solitude (1933), shows rabbi with Torah on left. The Praying Jew (1923, copy of 1914 work), oil on canvas, 116.8 x 89.4 cm, Art Institute of Chicago. Larger image. 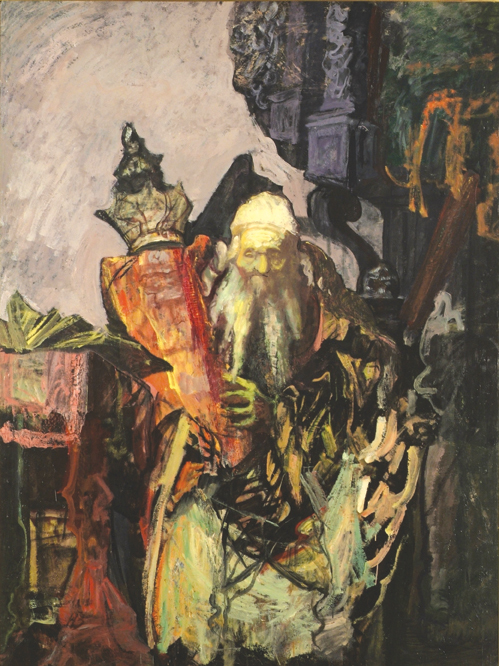 Hyram Bloom, Rabbi with Torah (c. 1955). Danforth Museum of Art. Oil on canvas, 72x54 in. Another. Rembrandt. Moses Smashing the Tables of the Law (1659). Oil on canvas. Gem�ldegalerie, Berlin, Germany. Tissot, James Jacques Joseph (French artist, 1836-1902), Moses Sees the Promised Land From Afar (1896-1900), Watercolor. 11 3/4 x 6 7/8 in. The Jewish Museum, New York, NY, U.S.A.